I am proud to be Hapa because I feel it is becoming the defining American experience, to be multiracial. The U.S. was founded by immigrants, and continues to be the destination dream country for expatriates around the world. The face of America is one of ethnic diversity and multicultural identity. Being biracial I am faced with the challenge of having to “choose” between whether I am White or Asian. I feel that if I was 3/4 of one race, and 1/4 of another, it may be easier for me. But I have even heard for some, whose racial makeup is so, they still claim the 1/4 of their heritage as their nationality. My mother used to say to checkmark “White” when filling out forms or identifying myself, because my last name was from my father’s side and he was the Caucasian parent. I begged to differ especially since I had no family in England, Ireland, or Germany, but nearly all my relatives were in Seoul. Where I grew up, Whites were the minority, so I had always hung out with Asians. But I still always felt like I stuck out, that I didn’t quite fit in completely. Hey there! I gotta say your story was pretty relevant to my own self as well! I love seeing the embrace in traditions being a part of peoples lives. But even better when you have influences from different backgrounds. I come from Korean, Caucasian, Spanish, and Irish backgrounds, and imagine celebrating holidays with family from those parts of the world. Sounds overwhelming, but in reality its the greatest gift a person can receive! So awesome on the kimchi comment! My girlfriend is also half Korean and she does the same. I’m half Taiwanese and don’t understand it -_-… (bud do enjoy eating it). Maybe you two are secretly plotting something! I’m pretty religious about the shoes thing at least. Korean hapa pride! Your hapa voice made me so proud to be 100% hapa, 100% Korean, 100% Korean-American. 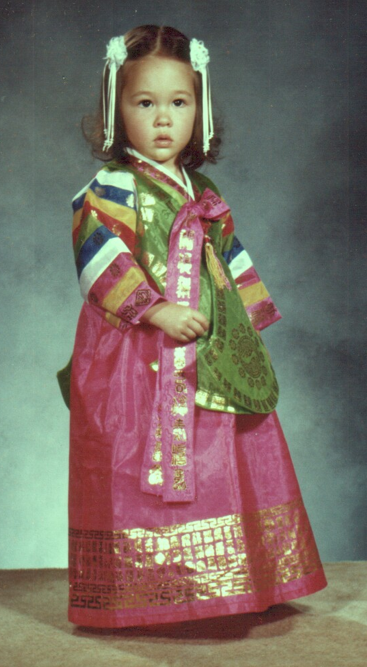 I have the same picture of me wearing a hanbok as a baby. I make it my profile picture on facebook regularly because I’m proud of my Korean and multiracial background. Thank you for sharing! Do you count yourself lucky, or Blessed, to be so beautiful? Mixed nationalities are often very beautiful. I think you’re blessed!